I let many quilt-along opportunities pass me by. There’s just so much going on online and limited sewing time, I can’t possibly participate in everything I’d like to. 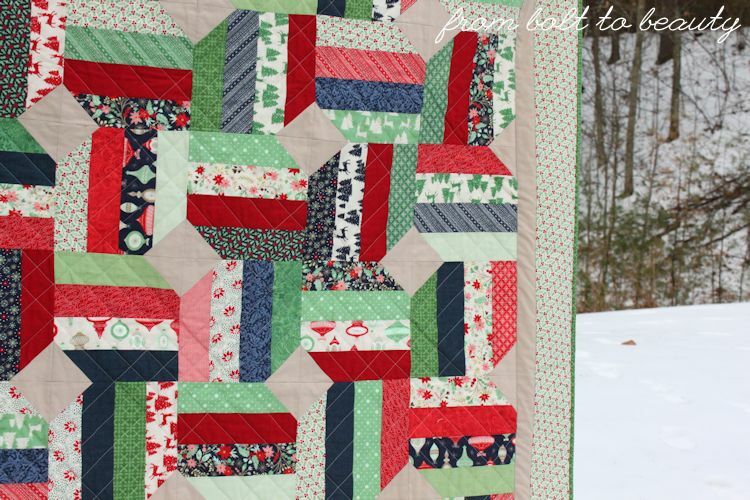 When I saw Meadow Mist Designs’ latest pattern—the Outlined Plus Quilt—and the corresponding quilt-along at Hyacinth Quilt Designs, however, I knew I had to make an exception. I’ve been meaning to make a Bonnie and Camille quilt of epic proportions, and I’ve wanted to make an Amy Butler quilt of similar epic-ness. My thought was that these quilts-to-be would be a spectacular cross-section of those designers’ work, and I would keep either project for me, me, me! Maybe this was the pattern I’ve been waiting for? Those designer-specific quilts would require buying fabric—perhaps a lot of fabric. 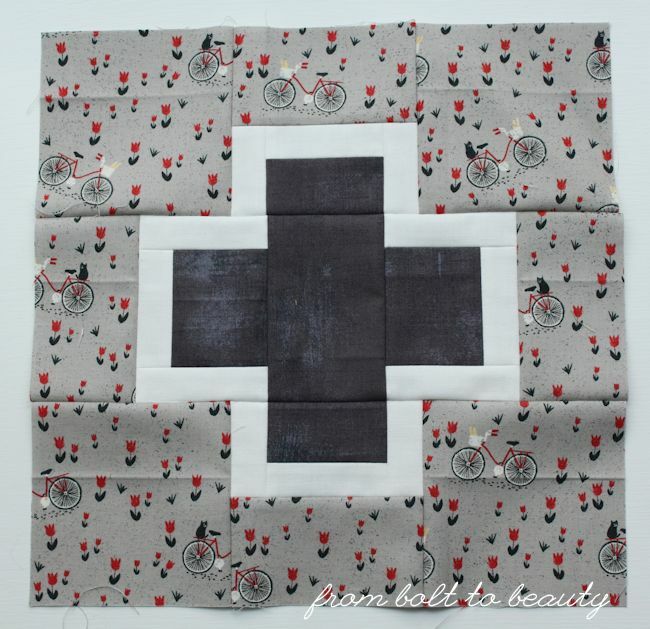 Then I realized I had the necessary fabric on hand already: my 40-fat quarter bundle of Basic Grey’s Mon Ami. 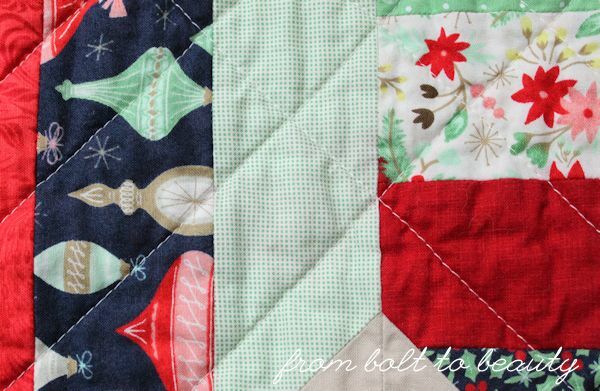 I wouldn’t do a designer-specific quilt; I’d home in on one gorgeous fabric line by one of my favorite design houses! Using Kona Snow as the outline for each of the pluses, I started cutting and sewing. 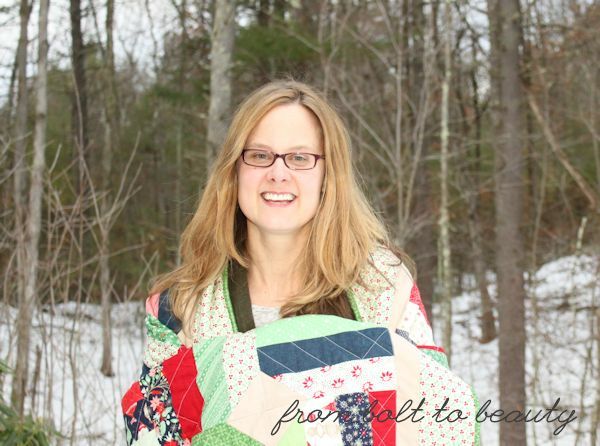 My goal is a throw-size quilt, requiring 30 blocks. I have 20 done, 10 more to go. Yes, this quilt is for me, me, me! This is my favorite block. I love the combination of blue and yellow. The grays in this block make me pretty happy, too. As I’m taking stock of this work in progress, two thoughts come to mind. First, I really love the combinations of fabrics in shades of blue, gray, yellow, and red. I’m not feeling the green as much. What do you think? Should I omit the green fabrics? I would have to remake four blocks. Here is the version with greens. And here is the non-green version. I think this is the winner, friends! Second, this is an unusual project for me to sew. 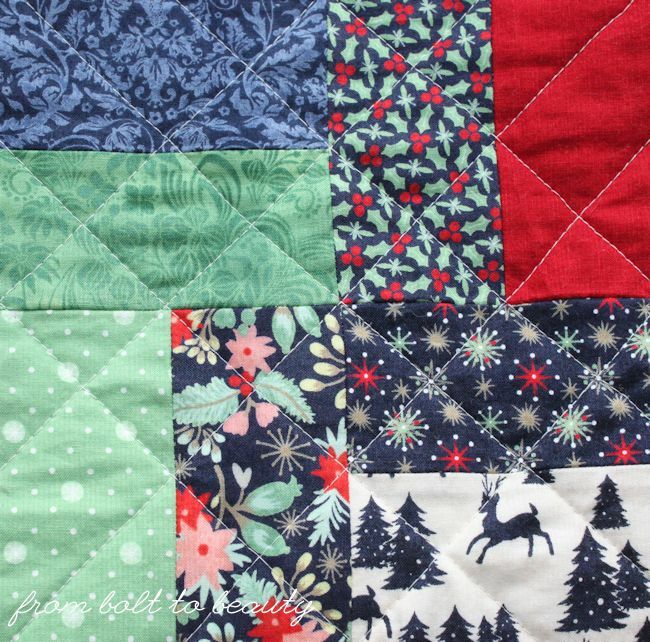 My quilty brain doesn’t think in terms of making one complex block (as opposed to, say, a half-square triangle block) and repeating it over and over again in a standard grid. There’s beauty in it, to be sure—I’ve gotten good at churning out these 12-inch blocks, and I find some peace in the repetition. I can think of only two other quilts like this that I’ve made: my Lotus Blossom Quilt and my Dogwood Blossom Quilt. I guess I’m the non-block quilt maker. It seems like a bizarre observation to make, but it’s true for me and the quilts I tend to be drawn to. Now it’s your turn to chime in. Do you have any thoughts about the green-fabric issue? 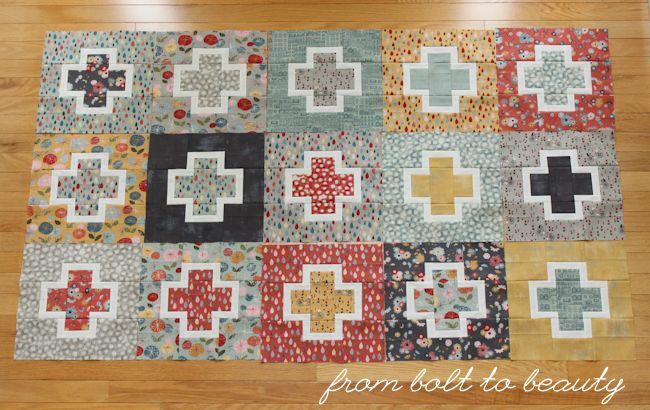 What generalizations can you make about your own quilt projects? Is it a palette that you tend to gravitate toward? Do you have a propensity for a particular design or technique? Let the rest of us know in the comments. Two weeks ago, I posted what I thought was a finished quilt, my Christmas in Bold Colors Quilt. Then I washed it, and the quilt was no longer in giftable form. I always wash my quilts before using them or giving them away. I’m a spray baster, and a good wash releases the adhesive. I usually hand-wash my quilts in the washing machine. I pour in some Soak liquid, fill the basin up with water, and throw my quilt in. I agitate the quilt a few times by hand, let it soak for a bit, drain the water, and spin the quilt. (Soak does not require rinsing.) I then pop the quilt in the dryer on low for 20 minutes or so and hang it up to finish drying. I was annoyed, but I kept my cool and put the quilt and its offensive red blotches in time-out. Then I considered what I could have done differently. In the past, I’ve used Retayne, a color fixative, prior to cutting and sewing my fabric. 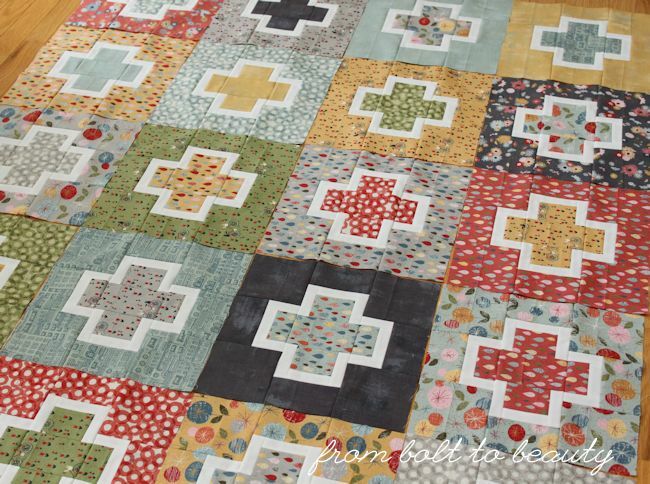 I last used it on this quilt, which features deep burgundies next to light fabrics. In fact, one of the burgundies bled so badly during the Retayne process that I chose not to sew with it. The others bled much less and posed no problems when I washed the finished quilt. The fabric that bled in my current quilt was a red Quilter’s Linen, from Robert Kaufman. I’ve bought Quilter’s Linen in at least a dozen different colors and haven’t had any problems. I suspect that the red would have bled badly in a Retayne wash. As a result, I would not have included it in the quilt, and Christmas in Bold Colors would be in the hands of the intended recipients by now. I tend to skimp on the soap or detergent I use. I figure that washing is a way to release the spray adhesive—it’s not like these quilts are dirty—and I don’t need that much. I’ve read since the bleeding incident, however, that soap helps prevent any released dye from adhering to fabric. The bleeding pattern on my quilt bolsters this theory. I experienced bleeding on only one half of the quilt. I’m sure that I folded the quilt loosely in half and placed it in the washer. I suspect that the side that was face down, which likely had more surface area covered with the soapy water, was the side that did not bleed. I like to hand-wash my quilts, figuring it’s less wear and tear on the fabric. Perhaps if I had allowed the washer to do its job, the soap would have been better distributed in the water and the bleeding would have not happened or would not have been as bad as it was. I own a box of Shout Color Catcher sheets. I’ve used them in the past plenty of times. I didn’t use them this time. I have no idea why. Perhaps if I had thrown a few into the washer, they would have adequately sopped up the excess dye. Sigh. Then, following the advice of Vicki Welsh, I filled my bathtub with 140-degree water and plenty of Tide Free and Gentle Detergent, a dye-free product I had on hand. I weighed the quilt down with the lids of plastic containers just as Vicki did and agitated the water every so often. After two and a half hours, I developed a tick—I had to see what was happening to my quilt! There was progress. The fabrics with white backgrounds were free of red dye, but the stained green fabrics were still a problem. The fabrics with white backgrounds look awesome. There still is a slight pink shadow on a green fabric or two. I am OK with that. To read more cautionary tales, see these posts. 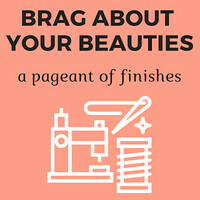 Got your own tale of woe or triumph? Share it in the comments! If you’re new around these parts, you need to know that I’ve declared war on my jelly rolls. 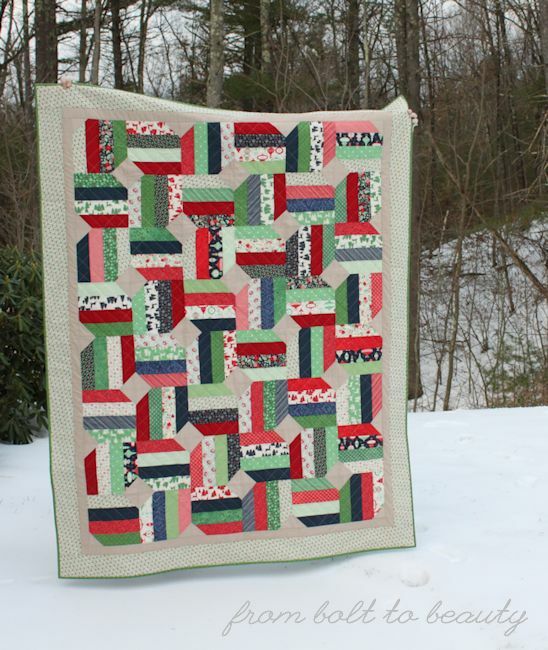 Back in November I took inventory and decided to sew with my four stashed jelly rolls, which resulted in this quilt and this quilt. Two noteworthy events have happened since those triumphs. 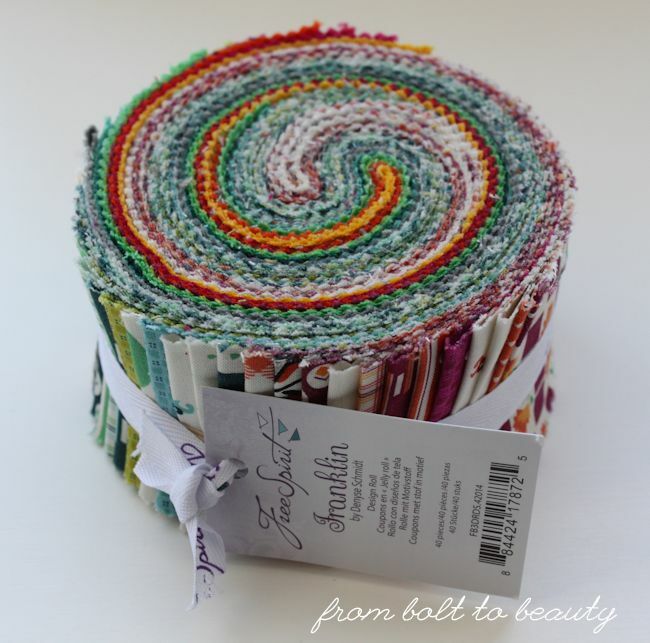 First, I found that I had another jelly roll, an all-white Bella solid roll, lurking in my fabric storage. Bah! And then, lured by the promise of 50 percent off, I bought this jelly roll at a New Year’s sale. In other words, I have exactly the same number of jelly rolls I thought I started off with back in November. Double bah! To chip away at those white jelly roll strips, I started playing with pixelated hearts. 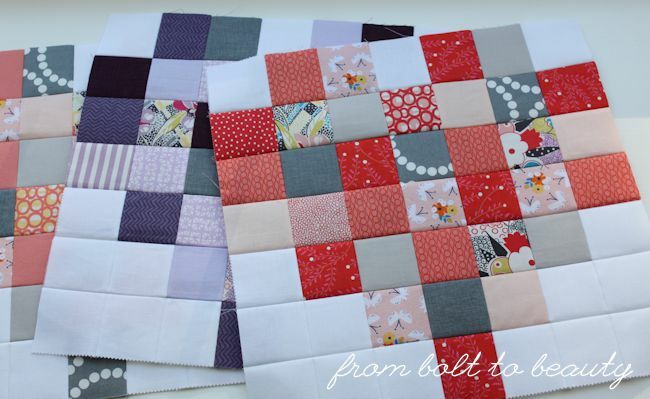 For the record, I am not a fan of heart anything, but using a mini-charm pack of Jen Kingwell’s Gardenvale as the inspiration for my palette, I had a lot of fun planning these blocks. 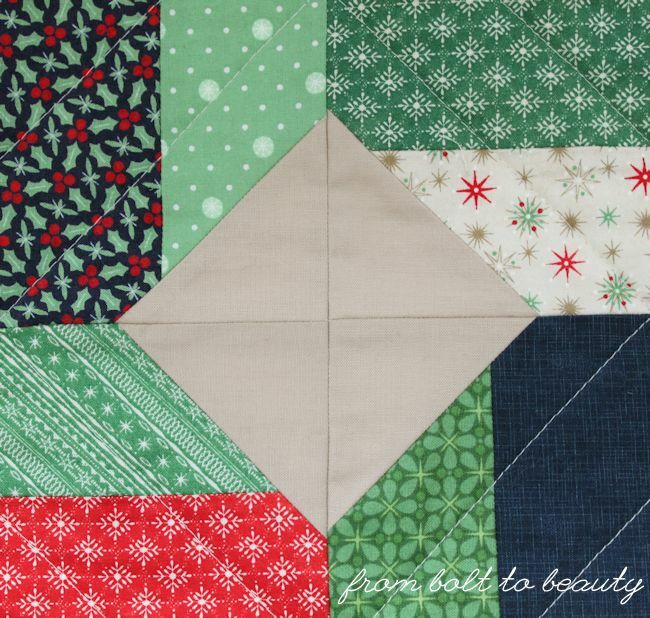 The sewing was fun, too, because I used the super-sneaky way of piecing simple patchwork. I discovered this shortcut years ago on Posie Gets Cozy. 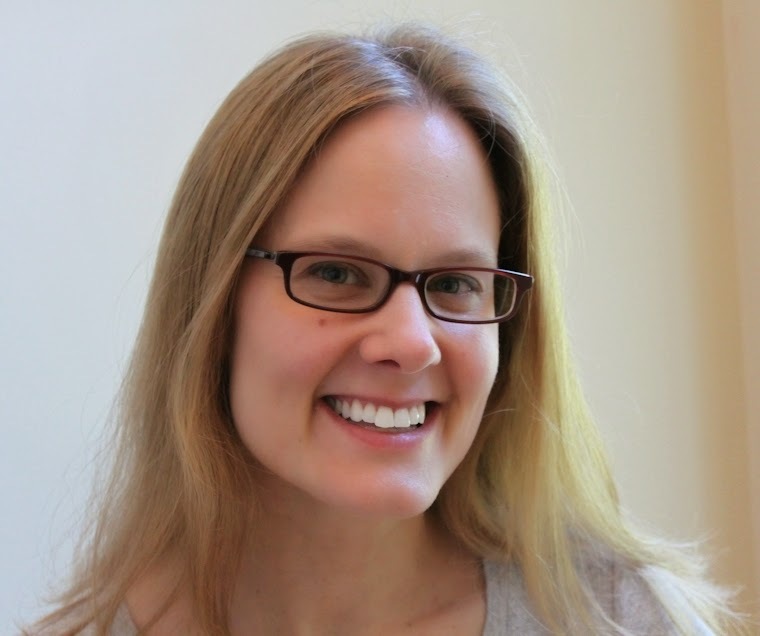 (A friend said she first learned of it on Elizabeth Hartman’s blog.) 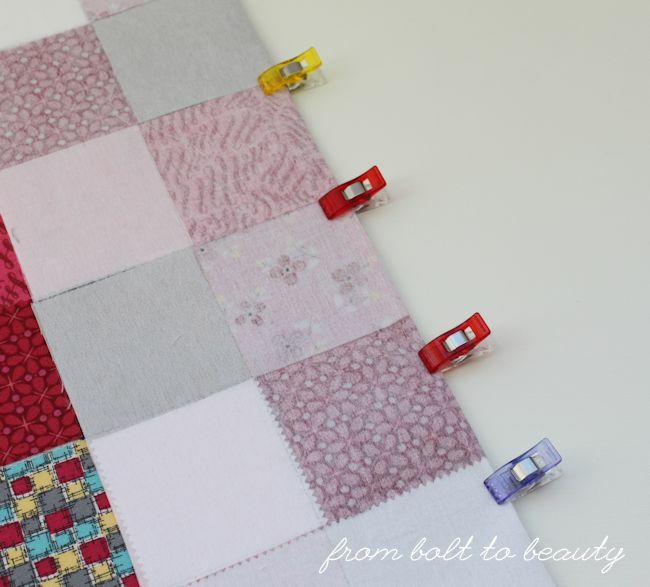 The idea is simple: You iron your squares to a piece of fusible interfacing, fold along a long seam, and sew. In the past, I used Pellon’s featherweight interfacing and pressed my seams to the side. It worked fine for, say, a pillow, but there was too much bulk for me to try it on a full quilt. In my latest foray into this technique, however, I used Pellon’s ultra lightweight fusible interfacing. It made all the difference. Want to give this shortcut a shot? 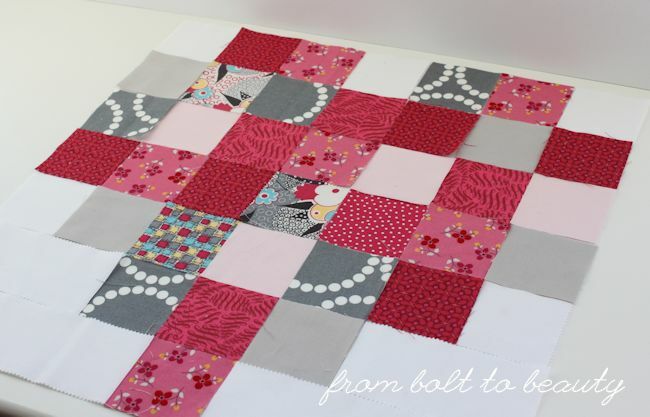 Check out the accompanying Tutorial: Less-Work Patchwork Hearts. 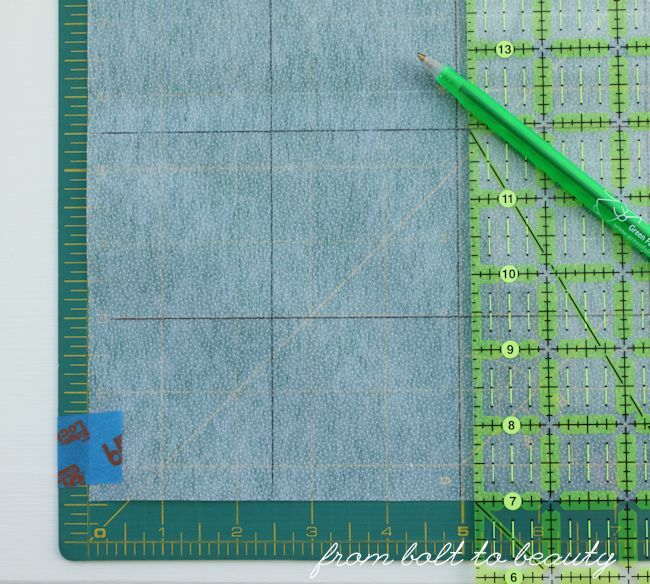 If you have played with fusible interfacing like this and have some advice, please share it with the rest of us in the comments. I won’t be posting any more about these blocks until they’re in final-quilt form. (My deadline, of course, is Valentine’s Day!) For progress reports or to post your own pixelated hearts, join me on Instagram. 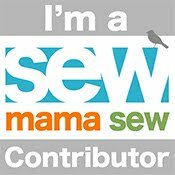 I’m @frombolttobeauty and will be posting to the hashtag #lessworkpatchworkhearts. * I found this interfacing on a precut 3-yard bolt at Joann’s. 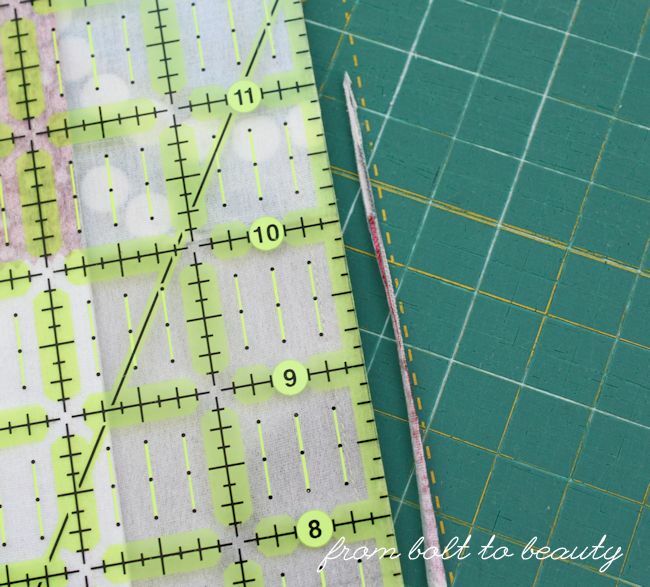 To make marking the 17½” x 17½” square of interfacing easier, tape it to your cutting mat with the adhesive side (i.e., the bumpy side) facing up. Using a pencil, mark lines every 2½”. In the end, you’ll have a grid that is 7 squares horizontally and 7 squares vertically. Preheat your iron on the cotton setting. Position the marked interfacing, adhesive side up, on your ironing board. 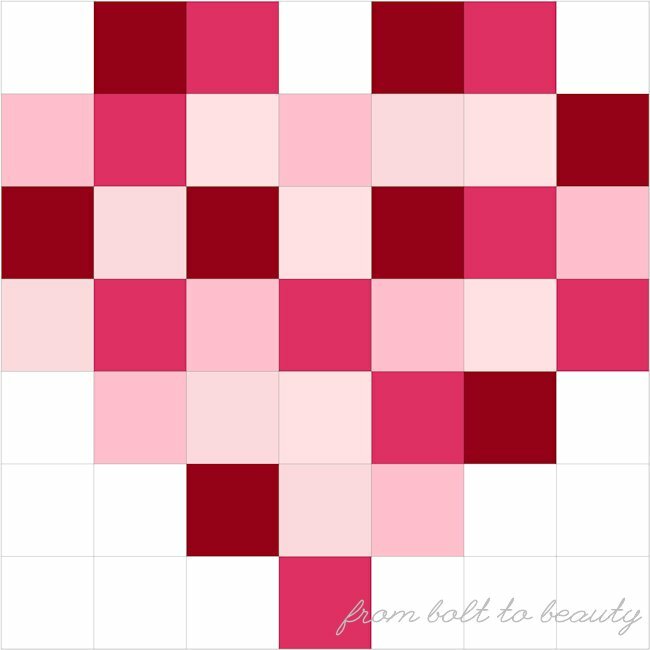 Lay out the 2½” squares for the heart and background. Once you’re pleased with your layout, fuse the fabric to the interfacing by pressing it with your hot iron. Double-check that all the pieces have adhered to the interfacing. 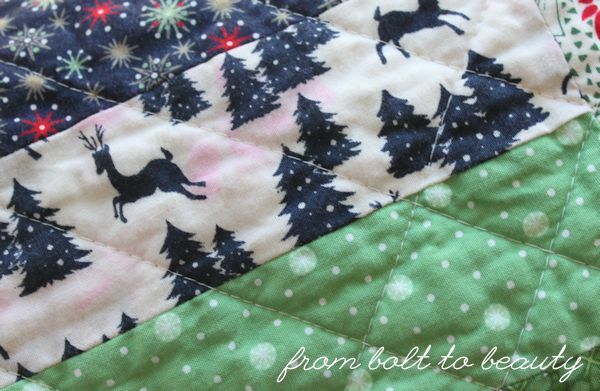 Fold your fused block along a vertical line so that the right sides of the fabric are together. 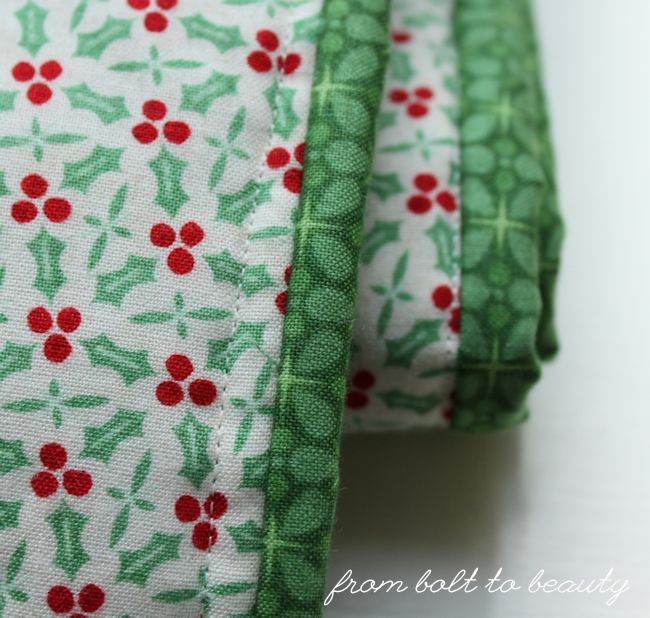 Secure with pins or clips, and sew a generous ¼” seam. Repeat with the remaining vertical seams. Slice off a tiny amount of each seam allowance, and press each one open. Repeat the process for the horizontal seams. This technique is fairly foolproof. (Truth be told, I did fuse the interfacing to my ironing board instead of the fabric, but that only happened once. Ha!) If you find loose threads behind any light-colored squares, gently loosen the fabric from the interfacing and use tweezers to remove the culprit. The earlier in the process you discover those threads, the easier it is to remove them. For progress reports about my own pixelated hearts or to post your own, join me on Instagram. 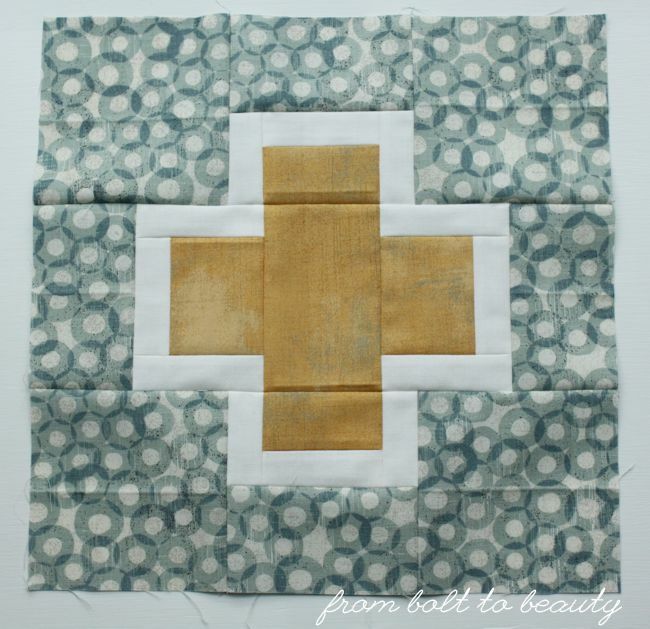 I’m @frombolttobeauty and will be posting to the hashtag #lessworkpatchworkhearts. Back in November I declared war on my jelly rolls. They had been “aging” in my stash too long. Use them or lose them, I said! 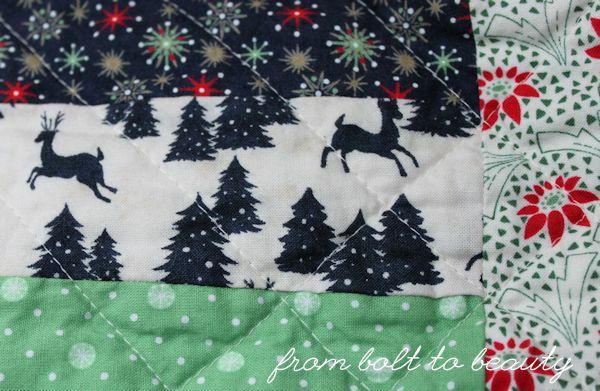 Toward that goal, I finished this Christmas gift, my Christmas in Bold Colors Quilt. 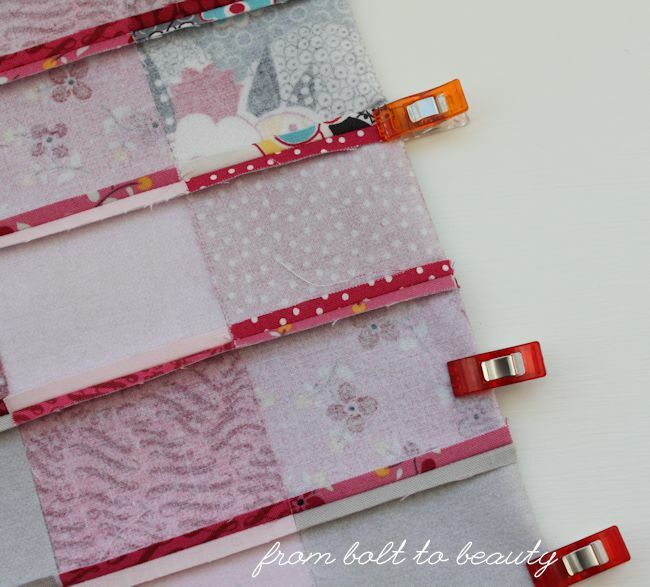 It’s the complement to my Ridiculously Easy Jelly Roll Quilt, which featured more muted fabrics. It’s a different kind of quilt for me, with lots of saturated color and patterns and none of my favorite Kona Snow. (The solid I did use was Kona Parchment.) Most of the fabric is from Basic Grey’s 25th and Pine line, left over from some mini quilts I made. I also got to use a bunch of scraps—some from my standard scrap bin, some from my Christmas scraps. Man, it felt good to use them up. I’ve had problems in the past with puckering while quilting, so I started quilting with my walking foot and set the pressure to zero. 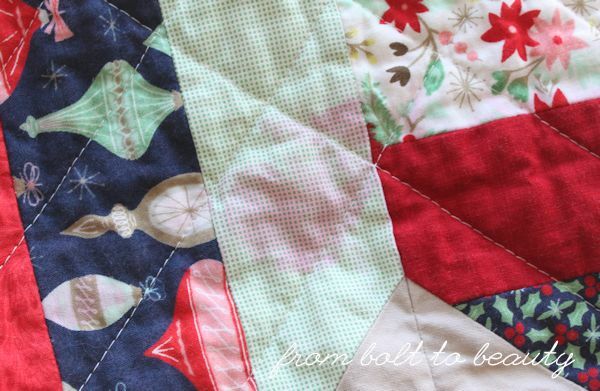 There was too much play between the walking foot and quilt, though, and my quilting lines were wiggly. Then I set my pressure to 0.5, and everything went much more smoothly. I still had a lot of control over the quality of the stitches, however, so I had to be attentive to maintain a consistent speed. 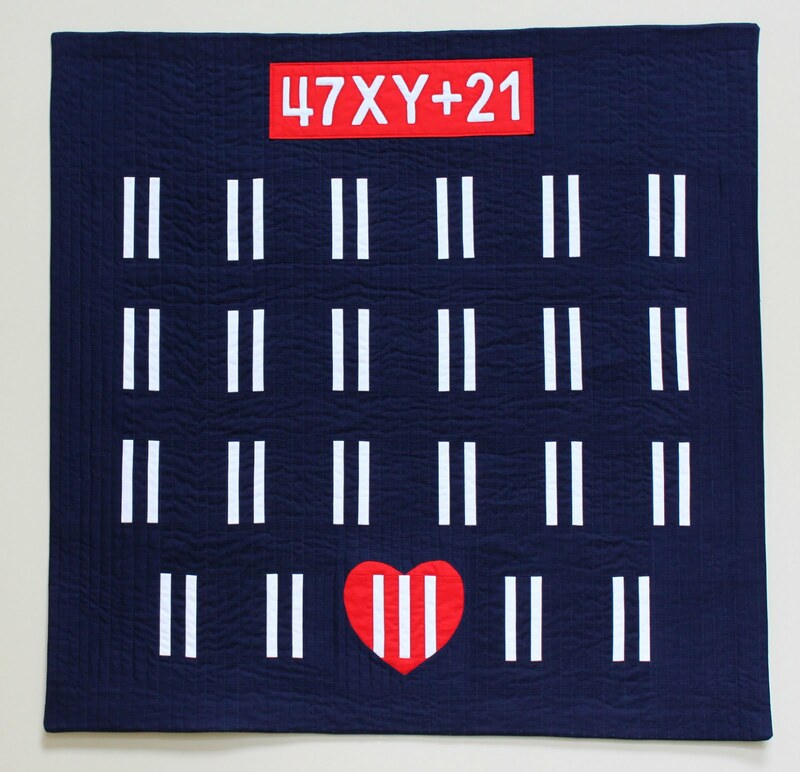 I quilted this project with straight lines. I’m not a fan of an all-over grid with lines that intersect at 90-degree angles (I don’t know why—it’s just me! ), so I omitted some of the lines, which resulted in a pattern that echoes the diamonds in the piecing. 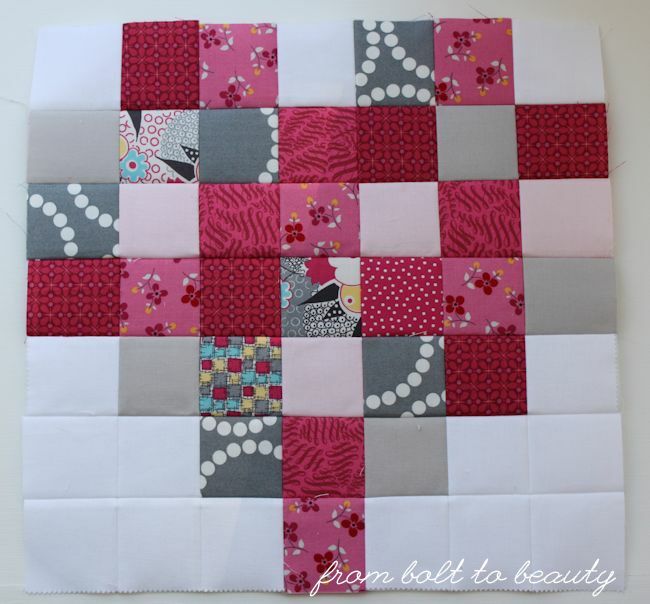 It reminds me of the quilting I did here, yet another Basic Grey project of mine. This diamond pattern is the result of my not-quite-all-over-grid quilting. Here the quilting creates echoes around the diamonds in the piecing. from the front but blends in well with the holly border.